The chemistry revisits the mechanism of amide formation from an acid and an amine, which I first described on this blog about four years ago. 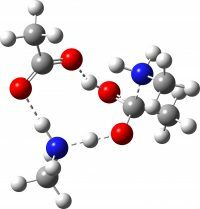 I had constructed a model of one amine and one carboxylic acid, to which I added a further acid in recognition that proton transfers are a key aspect of the mechanism. 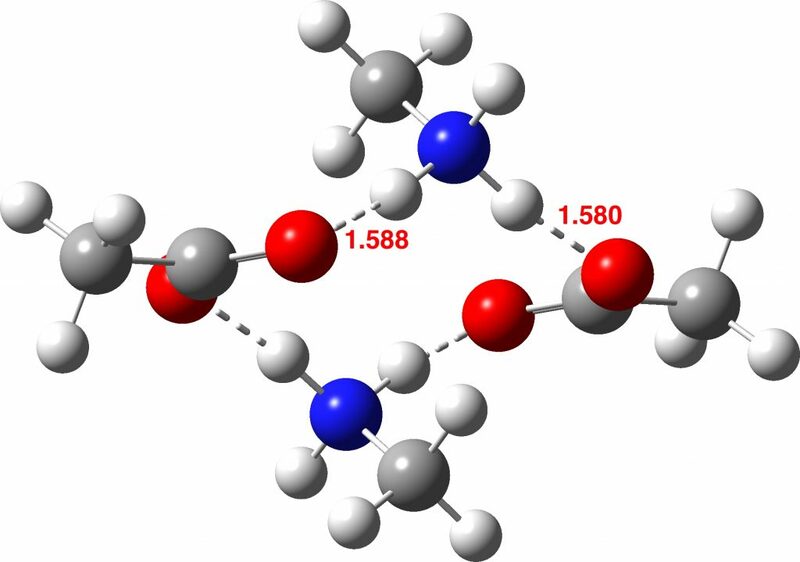 When the model is quantified using quantum calculations (ωB97XD/6-311G(d,p)/SCRF=p-toluene) it resulted in a free energy barrier ΔG298‡ of about 22 kcal/mol. Re-reading what I wrote, I see I did rather gloss over this value, which implies a decently rapid reaction! In fact, the reaction occurs relatively slowly at the temperature of refluxing toluene. Perhaps some alarm bells should have been tinkling at this stage (although the sluggish reaction might for example instead be due to poor solubility) and so here I have a rethink of the model used to see if that modest barrier really is correct. 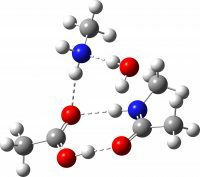 The new premise is to test if the required proton transfers can instead be mediated using a second molecule of amine instead of acid; thus two molecules of carboxylic acid are now accompanied by two of amine, one of which will be used to transfer protons. The second acid is retained to facilitate comparison. As before, the mechanism is characterised by three transition states and two tetrahedral intermediates. The new mechanism is summarised below, with TS1-3 being the White City Trio. The free energies are summarised in the table below. TS3, the rate limiting step, is slightly lower in energy if the amine is used for the proton transfer than via carboxylic acid. This is the wrong direction; we really want the barrier to increase to explain the relative difficulty of the reaction as observed in refluxing toluene! Fear not however, the new barrier is indeed a much more sluggish 28.6 kcal/mol (30.5 using a larger basis set). How did this happen? It’s the reactants! 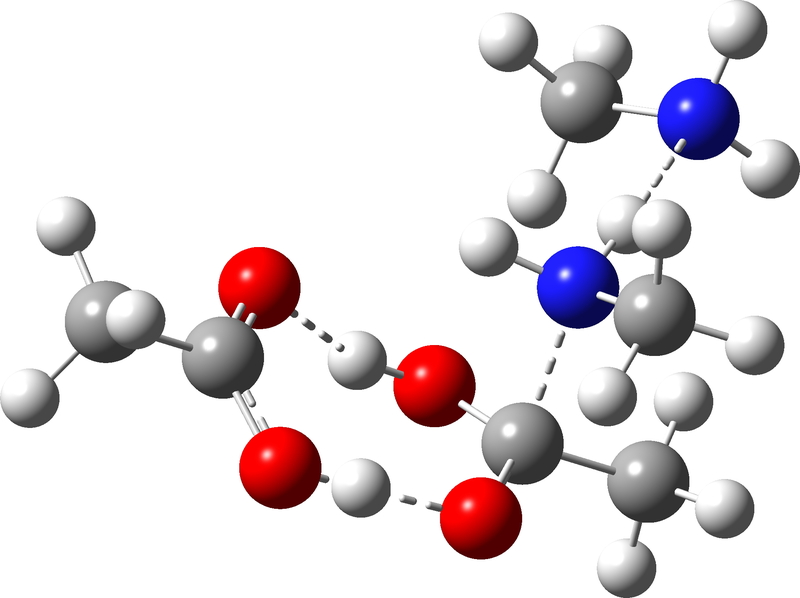 The original reactant model was based on the known structure of acetic acid dimer, with an amine weakly hydrogen bonded. Adding an extra amine now allows an entirely new motif to form, in which the amine disrupts the acetic dimer to form a cyclic system with a pair of very strong (-)O-H-N(+)-H-O(-) hydrogen bond units.† The original model did not have sufficient components to fully allow this to happen. So the White City Trio achieve a performance which helps explain why a reaction is sluggish rather than facile (normally one strives to show the opposite). Perhaps however it should be the White City quartet, in recognition that the reactant also had a role to play? ♣A photograph of the building under construction can be seen here. ‡Def2-TZVPPD basis set. †There does not appear to be a recorded structure for methylammonium acetate. We hope to obtain one to check what the extended structure actually is. ♥I will elaborate an interesting new use of this value in a separate post. This entry was posted on Wednesday, August 8th, 2018 at 7:41 am and is filed under Interesting chemistry. You can follow any responses to this entry through the RSS 2.0 feed. You can leave a response, or trackback from your own site. 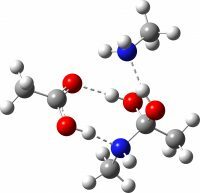 I noted above that I was unable to find any reported crystal structure for methyl ammonium acetate. 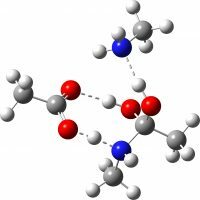 However, a calculated structure for this species has been suggested (DOI: 10.1002/chem.200902859). It differs from the one above in having bifurcated hydrogen bonding to just one of the two carboxyl oxygens, whilst the other carboxyl oxygen has just a single weaker hydrogen bond. 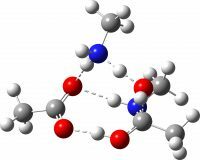 This alternative structure has a total of six (weaker) hydrogen bonds, compared to four (stronger) ones for the structure I suggest. I have subjected this alternative form to optimisation using the same method as above. 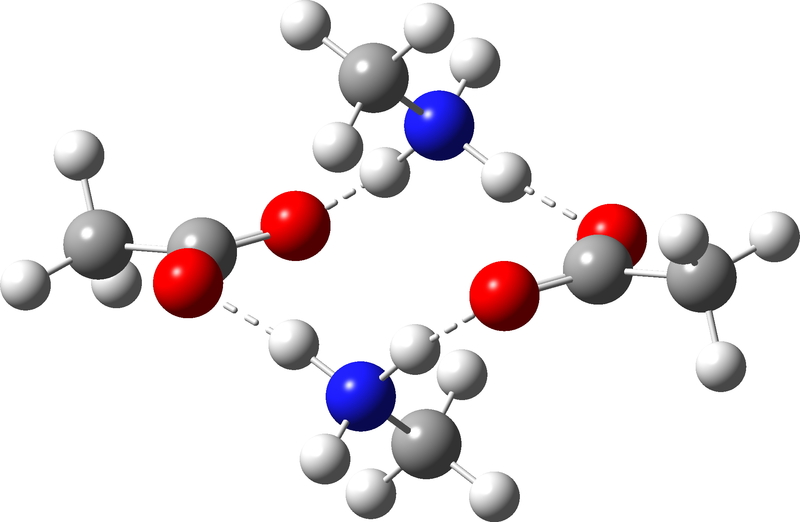 As can be seen from the animation below, the six-H-bond structure is not a minimum, and rearranges to the four-H-bond form during optimisation. If we determine the structure experimentally, it will be interesting to see which one is correct. 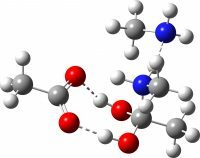 I also note that DOI: 10.1002/chem.200902859 has no supporting information I could find, and in particular no coordinates for the various computed crystal structures. The rate limiting step in the mechanism above is TS3, the cleavage of a C-O bond, accompanied by loss of water. This implies it would be subject to a carbon isotope effect. Using the ωB97XD/Def2-TZVPPD/SCRF=p-toluene frequencies, the calculated 13C isotope effect is 1.0247 at 412K (and 1.033 at 298K). The oxygen isotope effect is 1.037403@412K. If I find experimental values, I will report back here. This reminds me strongly of an observation I made concerning the aminolysis of a methyl ester. According to the literature, this reaction proceeds at room temperature merely by dissolving the ester in 0.880 ammonia and leaving it overnight. In my hands, this had always returned starting material quantitatively. I wondered if the reaction needed a proton to help neutralize the developing negative charge on the carbonyl oxygen in the TS. Lo and behold, when I added ammonium chloride, the reaction was done in an hour. Thanks for this interesting observation Nick. The Romans “fulled” their wool (cleaned it of oils) by trampling it under stale urine (!) I have watched people in Morocco using the same technique (upwind of the stink of ammonia! ), and I was astonished how effective it was, with the thick sheep grease solubilized and removed in a few minutes. Could this be working through the ammonolysis of the fatty acid triglycerides? Urea is a well known “organocatalyst”, catalysing all sorts of reactions. Probably not in quite the same manner as ammonia. 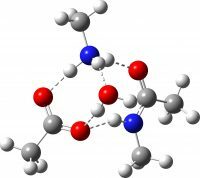 Regarding your aminolysis of methyl esters, a colleague has commented that ammonia works well if it is “fresh”, ie of 0.880 strength, but it does not take much loss of ammonia from such solutions to slow down the reaction. But if ammonium chloride works well even with weak ammonia, then it is certainly worth knowing. Of course, methoxy is a much better leaving group than hydroxide, so aminolysis of an ester is bound to be easier than that of an acid.